The Departure of the Soul According to the Teaching of the Orthodox Church is a comprehensive presentation the teachings of over 120 Orthodox Saints regarding the soul’s exodus to the afterlife. In vivid detail, the Holy Fathers describe what occurs when the soul is separated from the body and embarks on its upward journey towards the Kingdom of God. For Orders Outside the U.S. please CLICK HERE. 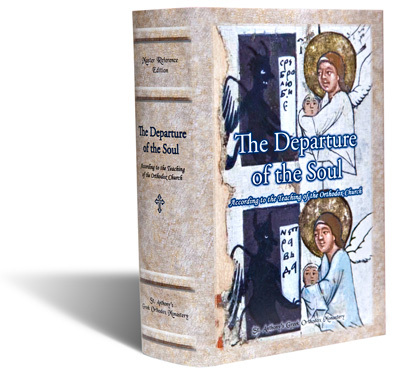 The Departure of the Soul According to the Teaching of the Orthodox Church is a comprehensive presentation the teachings of over 120 Orthodox Saints regarding the soul’s exodus to the afterlife. In vivid detail, the Holy Fathers describe what occurs when the soul is separated from the body and embarks on its upward journey towards the Kingdom of God. With over 750 pages of source material featuring many rare images and dozens of texts translated into English for the first time, The Departure of the Soul is unique as both the sole reference edition on the subject and a fascinating and spiritually profitable book for everyone seeking insight into one of the greatest mysteries of all. Pay with PayPal, Credit Card (via PayPal) or Amazon Pay at checkout. This is a wonderful work. The selections are easy to read and easily understood. The theology is accessible both to lay persons and to academicians. I enjoyed reading the book and found it beneficial for myself.